From the Warp: Using the Space Wolf Codex for Deathwing? Using the Space Wolf Codex for Deathwing? I guess it was only a matter of time when I look back at it now. What happened? I've decided to use the Space Wolves Codex to represent my Deathwing. Of course this means some changes, but let's look at how I got here first. I see it being a number of things that just added up over time but here are the big two. 1. A Codex (the current Dark Angels one) that lacks the life and character the newer books have. I say "life and character" because I don't know how else to describe it. These days, just anyone can do a better Darks Angels army than the Dark Angels can. Space Wolves can even do a "Deathwing" with more life and character than Dark Angels can. This wouldn't as big of a deal if it weren't for number 2 though. 2. A Codex (the current Dark Angels one) that doesn't even allow me to field the units and equipment my Chapter is historically known for. Mortis pattern dreadnoughts for example. This kind of thing kills me. I don't play competetively in tournaments so it was no stretch for me to start using Forge World rules for my Dreadnoughts and Land Raiders a few months ago. The people I play against don't mind either. But I still felt like I was having to use a Codex that had been stripped down to nothing. So I started looking at going to back to the previous edition. I was already using Forge World rules and most people cringe at that, so why not use older Dark Angel rules too? And I'll tell you what, it was refreshing to sit down and start building what I imagined and remember what Deathwing used to be like. But I still struggled with the rules and the older Codex. Then I sat down and looked through the Space Wolves Codex. I actually compared the two army builds before. Would you believe that I can build the same list with the Wolf Codex that I was building with the old Dark Angels Codex and Forge World rules before. At least close enough. I may end up going to 1750 and that's not something I ever really thought about doing before. With Space Wolves, I can add a few cool upgrades and be able to play 1750 without any trouble. So how does that work? How does one new, different Codex allow you to build the very same thing you would have needed an older Codex and "unofficial" Forge World rules to do just a minute before? Maybe it's just frustration on my part. I just want the ability to build my army as I imagine it being (from the background) and have it be something I can use on the tabletop with a reasonable opponent. Have it be a "legal" list too? Even better. Looks like I'm going to try Space Wolves for a few months. Or at least until the Dark Angels get the same life and character breathed back into their Codex that the Wolves waited so patiently for. Army Building, do you build the list you want to really build? I think goatboy's chaos goats made it acceptable to use the codex for other armies, since it worked out so well. I disagree Big Whit. People have been doing this since Codex Ultramarines (1995) as far as I am aware, and probably before that too. Yeah, people have been doing it since the dawn of time. I won't do it, though. I was in the process of updating my Dark Angels to run them as Codex marines (since I like the Battle Company Dark Angels more than Deathwing/Ravenwing), but when the Space Wolves codex came out... I said screw it. I'm sticking with the DA codex. Good luck making the switch, I know that I feel that it has paid off. It is amazing how versatile the regular Marine codex can be when you come to Dark Angels. Want Terminator Heavy? Combat squad those (and put two heavies in one squad). Oh, the the weapons are all the new handy version too. Want veteran power armor? Pedro and stock Sternguard and Vanguard, with some regular power armor troops as back up. Ravenwing suffers, but scout bikes become available. Need a super Librarian? There is that guy, who is, it, umm ya, Tigerius. Want a master strategist? U think the Ultramarines has one with over-sized mittens (in Terminator armor no less. I think that using another marine codex fits in with Jervis's standard bearer article a while back. It really doesnt matter what colour you paint your marines just that you use a fair set of rules so that each player enjoys the game. Rushputin: I was determined to stick with the DA codex for the longest time... even when Wolves came out, I continued using the DA Codex. FoxPhoenix135: I hope it does pay off. I don't expect to start winning my games all of a sudden, but I feel like I've got a little more freedom to build my Deathwing how I "want" and imagine them being built. And I'm using a Codex that's current to build the entire force. Of course I'll be going back to the DA Codex when it gets updated provided it gets the attention all the new ones to date have received (which I can only imagine will certainly happen). DOC: I don't mind count's as armies or using other Coedx books myself to represent a force. I just wish GW would put the time and effort into each book so that people didn't feel like they were getting left behind or "not" updated when due. I can only image how Dark Eldar players or Necron players feel. I'm in the same boat with my Blood Angels (though luckily they are getting an update soon if the rumors are true), so I am using the SW dex until my BA can get on the table with some decent wargear. Having terminators with TH/SS combos isn't quite as scary when they don't have the 3++ save throughout. I know hoping for a 1st company is too much to ask for, but I can dream at least! Noooooooooo....dont give in now. You are the best of us. Indeed it was some of your posts that helped convinced me to go DA instead of SW for my First Company. FoxPhoenix135: If the leaked version that's floating around is true, then the Blood Angels will definitely have some cool stuff of their own that brings them back to life for 5th ed. RuntMcRory: I'm not the best of us... until GW can bring the life and background back into the DA, I'm going to try my hand at using the Wolves codex. I won't be painting my guys to look like Wolves any time soon, I'm just going to be using a set of rules that arguably represents my Chapter better than my own Codex does (with the self-imposed Deathwing army limits). Hahaha.....1750pts, and the Space Puppy Codex to boot! What is the world coming too? This is going to be fun topic on wednesday night during the old-timers league. My friend plays Space Wolves and I like the way he plays. He has an overall strategy but he also plays how the unit would actually behave. So the command unit would do the gutsiest thing because they are heroes looking for glory. I find it actually works as a tactic because the units have been built by GW to work that way. Don't get me wrong I know that it has been it has been done before, but with the popularity of BOLS it is more accepted now. Goatboy's army has been seen by a lot of players, and it hasn't seen a whole lot of scepticism. Rick: I'm not taking any lip from any of you guys this Wednesday night. And I'll have you know that I haven't started reading those books yet. Big Whit: I have to be honest, I've never seen the army you're talking about, but if you're referring to the use of one Codex to represent another force (that may or may not already have it's own Codex)... it's nothing that hasn't already been done by players for years long before any of us got here. I'm perfectly fine with people using the Codex they think best fits their army. Pre-Heresy players have to chose what book their going to use when it comes time to representing their force. I've changed for a couple reasons myself. I would encourage anyone looking to do the same to really think about why they are doing it. Changing to a new/different Codex is not always the answer. Mik: I'm not gonna lie, making the switch has brought a little excitement back into the game for me. I even built a Librarian for my force and I've been wanting to do that for the longest time now. If you'd done this back when the SW codex came out I would have accused you of bandwagoning (not seriously, just in jest). But I agree, that the last few codices that have come out seem to have a lot more pizazz than the codices that came out during 4th Ed. Ron we're doing a friendly series of games this coming Saturday with the new Battle Missions rulebook. Forgeworld rules and models are fine. Thought you might like to get involved, seems like something you'd like - and somewhat applicable to your post too. I'm not trying to sound like a jerk, Whit, but get over your blatant fanboyism of some nerds' blog. Counts-as space goats were not the first, most original, or most inspiring counts-as army ever. They have not opened the floodgates for other players. People I know were doing this before BolS put their whack opinions on the internet. Ron, giving each other flak is half the fun of the Old-Timers :) Glad the change has put a spark back into the game for you. It is why we play the game.....to have fun! Right on! Do what you think will let you have fun, to heck with the rest. After all, it's just text on a page and paint of a figure in the end. 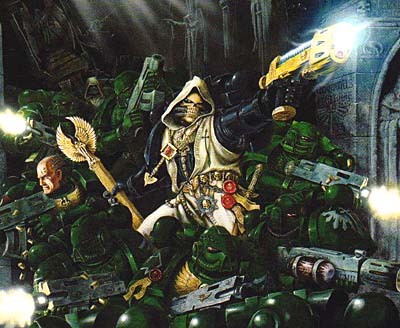 I've been giving this post a lot of thought, and I keep coming back around to the same question: how exactly are GW supposed to translate the Dark Angels' character into rules? It seems to me that everything cool about the DA is wrapped up in their background, their history and their aesthetic, and that none of it seems to translate into the rules the way that (for example) the Blood Angels black rage does. I recognize that there's a large and enthusiastic player base out there that deserves better than having their army be used as a test bed for the next vanilla space marine codex, but there's a reason GW decided to do that - Raven/Death/Doublewing armies aside, there's practically no difference between the DA and their regular codex brethren. If there hadn't been a DA list from 2nd ed. onwards, I expect GW would feel quite comfortable rolling the DA into Codex: Space Marines as a set of chapter tactics. I don't envy whoever's writing the next book - either they do something radical with the background, or they turn out another dull codex. Either way, a lot of people are going to be angry. The thing is, personal choice aside, that I still think the DA codex, for all its shortcomings, better represents the Deathwing than the SW one does. All of which I have expounded on in my blog over 2 entries. That being said, the SW codex is good I suppose. Rumour has it new DA codex within the next 2 years or so. Hopefully this will lure you back. RuntMcRory: I think the Dark Angels Codex does a sufficient job. But, I believe now that the Space Wolves Codex does it and allows a bit more freedom, gives you access to better and more current equipment and allows you the ability to customize your force much more than the Dark Angels Codex does. It always bothered me that the Wolves Codex "feels" more Deathwing than the DA codex does. When the new Dark Angels Codex does come out, I will be excited to say the least and will most likely go back provided they get the same treatment as all the current books are getting. I like the feel of the new books and I hope that GW can perfect what they're trying to do with them so that the next books fit in and it all starts to come together. Man - now I'm going to have to seriously consider opening the Wolves codex for my DW variant! yes it is very unfortunate that the codex for dark angels is showing it's age. It's also unfortunate that the Space Wolf Codex is so good. But I do not think that fielding an army from a different codex because the rules are nice is a good idea. I might as well field my imperial guard as orks cause I like the toughness 4. Think about it. It's doable. I can field my Tau as Space Marines. Why not? Or I can field my Daemons as an all reserves Space Marine Codex. They possessed the marines in the drop pods and popped out as daemons. Why not? I think if you want to play wolves, play wolves. If you want to play Dark Angels, play Dark Angels. Again, please take no disrespect from my post. Just my opinion. Mike: None taken. As long as it's constructive, I certainly don't mind the dissenting opinions. You bring up good points.